I just wrote reviews noting how much I love Neutrogena's "Rainbath Bath and Shower Gel" and Dove's "Go Fresh Cool Moisture Body Wash with Nutrium Moisture (Cucumber and Green Tea)." But I'm fickle. I love the BEST shower products available. How would you feel about an all-natural bath and shower gel that has at least eighteen uses, is never tested on animals, and works unusually well? Try Dr. ...read moreBronner's "Peppermint Pure Castile Soap." You'll do yourself--and your loved ones--a huge favor! Although Dr. Bronner's is available in a wide variety of scents, peppermint is their most popular. It will actually want to make you get up in the morning and get going (did I actually just type that)? The peppermint essential oil can be used from head to toe for an exhilarating, tingling sensation which refreshes beyond description, a special delight if you've been working hard and want true renewal. The creamy, emollient lather cleans thoroughly, dissolving dirt completely. 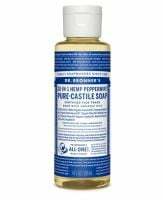 Available in a large range of sizes at Dr. Bronner's site ($2.99 for two ounces to $59.99 for a gallon), the formula also contains Organic Coconut and Olive Oils, Glycerin, Organic Hemp and Jojoba Oils, Citric Acid, Vitamin E, and Sea Salt. What else makes this unique? The tender nature of this product allows you to use it to brush your teeth with it (yes, you did read that correctly), clean dentures, use safely on babies and pets(! ), and even wash delicate clothing, such as wool. Sinus problems, headache, clogged pores, or just a need to feel like a new person? Rinse a wash cloth in a mixture of water and Dr. Bronner's and lay over face and head, massaging gently into scalp. Sore, tired feet? A soak in this will renew them and make you want to dance! How best to convince you of its benefits? We had a thirty-two ounce bottle in our shower ($16.99). I used it several times and then it disappeared. I asked my husband if he had seen it. With a red face he said, "The dog and I used it. We like it a lot." The dog?! Dr. Bronner's liquid soap is really amazing! It has many uses. I love using this as a body soap because it really tingles, and you feel clean without drying out your skin. I also like to use this to clean my floors. It does an amazing job especially since there aren't any harsh chemicals in it. I would recommend using this for everything and anything! Your body and home will thank you! Try any of the scents but if you really want the tingle, the peppermint is the one to try!